Welds 24 gauge up to 1/4 in. (6.4 mm) thick steel. MIG Ready. Amp range of 25 - 140A. Owner's manual with installation, operation and maintenance guidelines. Professional and durable wire feed performance. Five voltage ranges allow you to fine-tune the arc. Easier to transport: increased ability to weld where you need to weld. Access makes it quick and easy to change polarity between solid or tubular wire. Increased visibility to the user interface makes adjustments easier. Protects power transformer from thermal overload to ensure reliability. Protects wire feed system from overload, no fuses to change or circuit breaker buttons to reset. Mild Steel 24.00 ga - 1/4 in. Replacement MIG gun for Hobart Handler 175/180 welders with 10' cable. For welding wire diameter .030-.035". Includes 1 Nozzle and 4 Contact Tips. .023 inch contact tips (5 pack) compatible for use with Handler 140, 187, 190, 210, 210MVP, TREK 180 and IronMan 230 + 250, Millermatics, and later Hobart Beta-MIG 1800 and 2510 welders. Pack of 5 .030 inch contact tips compatible for use with Handler 125, 125 EZ, 130, 140, 190, 210MVP, TREK 180, Auto Arc Toolmate 100, IronMan 230 & later Hobart Beta-MIG 1800 and 2510 welders. Pack of 5 .035 inch contact tips for use with the Hobart Handler 125, 125 EZ, 130, 140, 190, 210MVP, TREK 180, Auto Arc Toolmate 100 & IronMan 230 & later Hobart Beta-MIG 1800 and 2510 welders. This contact tip adapter is made to fit your Hobart H series MIG gun. 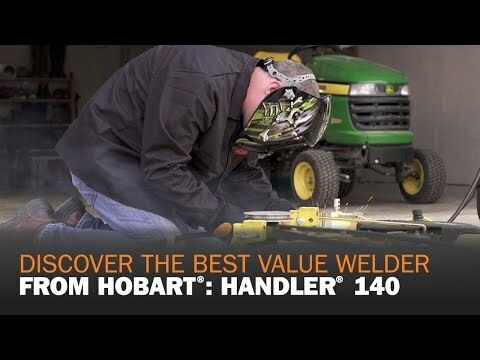 If you’re looking for the best affordable MIG welder, the Handler® 140 delivers the industry’s top value. Watch as Joel Ort with Hobart Welding Products walks through step-by-step instructions on how to build a grinder stand. Learn the basics of MIG welding and how to identify the right machine for your needs.